I am in a cupcake war. Standing in the kitchen, covered in confectioner’s sugar, I had been defeated by my strawberry cupcakes. I’d volunteered to bring cupcakes to the baby shower I was hosting the next day, but my recipe had turned into one big blob of pink mess. These cupcakes just would not do. Insecure, I allow the frustration of failure to mess with my head, causing me to spiral into doubt, which steals my confidence. I hear a soft whisper that I am like these cupcakes…not good enough. Instead of letting good enough be good enough, I want to be, have, and give the best of myself to every aspect of my life. That’s why I thought I could make these cupcakes, and now that’s why I’m being overly critical of myself. Do you ever allow the pressure of perfection cause you to melt down, especially before a celebration? It seems to me that women are desperately chasing perfection, and when we don’t capture it, we lose control over our emotions. Perfection is passion, an ideal that makes us feel so strongly about the matters of our hearts that we act in ways that make us later feel shame and unworthiness, like we will never quite measure up. Passion doesn’t always lead to positive results. How can we pursue perfection without becoming undone? 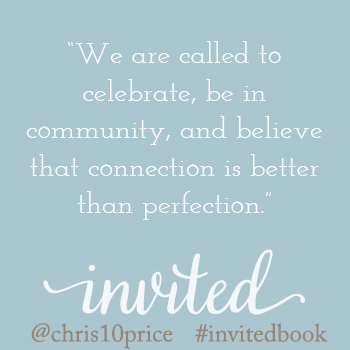 We are called to celebrate, be in community, and believe that connection is far better than perfection. The definition of connection is “a relationship in which a person, thing, or idea is linked or associated with something else.” In Genesis 1, God said, “Let us make man in our image, in our likeness.” Our bodies and our souls are bound to God, the Son, and the Holy Spirit. Like links on a chain, the Trinity designed us in their image for connection. God invites us to release our anxieties, receive others in love, and rejoice in the moment. We can spend our whole lives trying to practice hospitality perfectly, but God simply wants us to accept His invitation and extend His love to the people we cherish most. The next day, I woke up and called a local bakery to order two dozen strawberry cupcakes. Arriving at the baby shower with boxed cupcakes in hand, I arranged the cupcakes on a white tiered cake stand on the dining room buffet. They were delicious, beautiful, and store-bought, but it didn’t make my contribution to the party any less. That night, instead of feeling not good enough because I couldn’t bake cupcakes as beautiful as these store-bought cupcakes, I was able to connect with friends and watch the mother-to-be open her presents without the pressure of perfection. 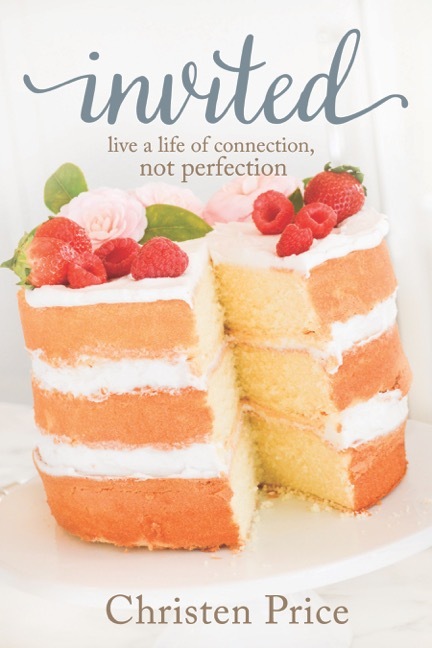 Let’s stop letting perfection make us feel not good enough, especially on matters like store-bought or homemade cupcakes. God is perfect so we don’t have to be. He invites us to live free from the stress of planning, preparing, and performing perfectly and to just be in Him. Hospitality isn’t about perfection; it’s about connection. Now, go eat a cupcake! 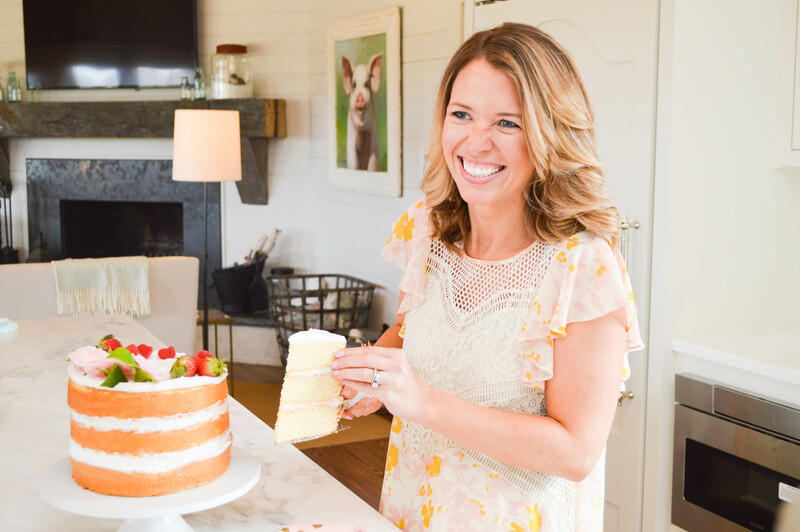 Thank you so much for hosting me on your site Kristin! Your love for hospitality is so evident! Thank you for sharing! Your so right, hospitality is about connection, not perfection. There are so many times I do not volunteer to host a gathering due to the expectations I place on myself. Thank you for reminding us the importance of connection! I plan on placing a link to your post in my August newsletter – thank you again!